One of the biggest ships at sea- offering maximum choice and comfort. The Celebrity Equinox is part of the Solstice-class of ships from Celebrity Cruises. Carrying 2,850 guests the Equinox is one of the biggest ships at sea. 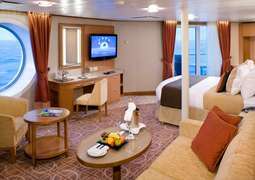 It is however, one of the easiest ships to navigate around, with well thought-out layout and interior design. One of the best features on the Equinox is the Lawn Club. This 2000sqm real grass lawn is on the top deck and offer guest a quiet and country-club feel. Guests can play lawn games like croquets or pitch and putt, or even relax and unwind with a picnic and enjoy the view. Another feature of the Solstice-class of ships is the multiple dining options. The Silhouette Dining Room is the main dining area on the ship, however, there are multiple options including the Tuscan Grill, Murano or Silk Harvest which serve a selection of specialty Mediterranean and Asian dishes. With a range of entertainment options on board the Celebrity Equinox, including the 1,115 seater Equinox Theatre, there is always something to keep you entertained in the evenings. All cabins on board the Celebrity Equinox are comfortable and furnished to the highest standards, perfect for all passengers. Those looking to live a real life of luxury during their holiday will be thrilled with the suites available, which come with special service and exclusive advantages, such as a European-style butler service and in-suite meal service. 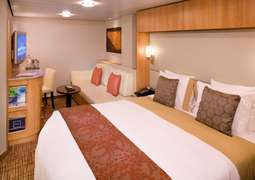 All cabins are well-equipped to make yourself feel at home while on your cruise, with a welcoming design and amenities like an interactive televisions and a seating area to relax in. The family veranda stateroom is ideal for a family trip, with plenty of space to make yourself comfortable. There is a strong focus on dining on board the Celebrity Equinox, so you will find an abundance of dining options available. The Silhouette Dining Room is a deceptively intimate venue to enjoy tasty dishes prepared with quality ingredients, sure to satisy all tastes including vegetarian and gluten-free. For a casual dining experience the Oceanview Cafe is ideal, where you can choose from a wide variety of foods and the option of enjoying it indoors or on the sunny open-air deck. Gastrobar is an experience not to be missed, where craft beer, creative cocktails, comfort food and great music all combine to provide a welcoming and enjoyable place to spend your time and discover new tastes. Other highlights on board are the Silk Harvest Restaurant which serves tasty asian cuisine in a family style and also the Mast Grill serving up hamburgers and other grill favourites poolside. The Equinox has an array of different ways for you to make sure you enjoy every moment on board. The Lawn Club, on the top deck, is the perfect place to relax and enjoy casual outdoor activities. Up here you will find the Hot Glass Show, where professional glass blowers from the Corning Museum of Glass give incredible and intimate demonstrations of their trade. In the Equinox Theatre you will find after dinner shows which include singers, musicians, magicians and theatrical productions. The Sky Observation Lounge is also a must see, transforming from a quiet refuge to enjoy a cocktail with a spectacular view to a stage for interactive themed parties and live music and dancing. There are plenty of places on board for you to enjoy an evening drink, from the fresh frozen cocktails at slush to the beer-lovers Michael's club and ice-topped Martini Bar. Let yourself be pampered in the AquaSpa area with its classic saunas and steam baths, and the one-of-a-kind Persian Garden filled with fresh, calming aromas. Many diverse wellness treatments and a thalassotherapy bath are also offered in the spa. To shine from the outside as well as the inside, treat yourself with a visit to the beauty salon for manicures, pedicures and hair styling. For an active balance, visit the fitness centre to work out with modern exercise machines for endurance and power training. You can also take advantage of the great array of course offerings, including yoga, Pilates, aerobics and much more. For a journey on the Celebrity Equinox, casual and sporty clothing is recommended during the day, whereas elegant evening wear is recommended for the evenings. However, all who prefer to dine more casually in the evening are more than welcome to do so in the laid-back atmosphere of a self-serve restaurant. Although the main language spoken on board is English, some of the crew members and reception personnel also speak German. Menus and the daily programme can also be provided in German, and a German-speaking tour guide will be available for most land excursions. Celebrity Equinox is one of the five Solstice-Cruise ships made in Germany by Meyer Werft. It is a classy ship with modern facilities pertaining to: foods, accommodation and entertainment that guarantee a fruitful, luxurious and relaxed trip for celebrities across the Mediterranean. It is the second of the Solstice Cruise ships. The other Solstice Cruise ships are: Celebrity Silhouette, Celebrity Solstice, Celebrity Eclipse and Celebrity Reflection. These ships are owned and operated by Celebrity Cruises. The $750m water vessel has a length of 315m, a beam of 37m and an 8m draft. A beautiful voyage in Celebrity Equinox assures you of not only mere comfort or availability of essentials, but guarantees you exclusive services. For instance, the ship has a large theatre and disco (from where people can enjoy pure entertainment at its best), 10 restaurants (which attend to the diverse feeding needs of most people in terms of: breakfast, lunch and dinner; dinner is served at 6.15p.m and 8.45p.m to accommodate different people’s feeding styles) and a grassy lawn at the top deck of the ship (where people can relax and delve their feet as they enjoy the cruise or play some sports on real-growing grass). The ship also has facilities and amenities which serve people with special needs; such as availability of wheelchair-accessible staterooms and decks for utmost mobility and enjoyment of the ship’s services by these people. 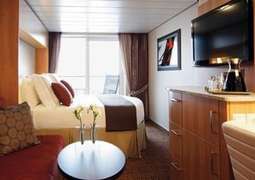 Paramount to every classy cruise, and the comfort of guests aboard the ship, are sophisticated and spacious rooms. The ship has 19 decks, a capacity of 2850 passengers and an approximate of 1250 crew members. 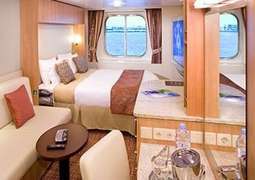 Staterooms on Sky Deck and Penthouse (Deck 10 and 11) are the best and have been highly rated by cruisers. They are quite spacious, have beautiful views and are quiet. They also have the best services in terms of crew attendance though generally, the whole ship has excellent services. Staterooms on Continental and Plaza decks, that is Decks 3 and 6, may not be as comfortable as noise sometimes filter in. They are, however, spacious and wheelchair-accessible. All in all, Celebrity Equinox will give you value for your money. If you are planning or have been dreaming of taking your family for a beautiful ship cruise- worth a lifetime of experience-, now is your chance to do it. Check out the existing offers that CruiseAway has for you on Celebrity Equinox and other sophisticated ships; so that you make an informed decision in booking your trip. Our cruise experts at CruiseAway are waiting for your call!